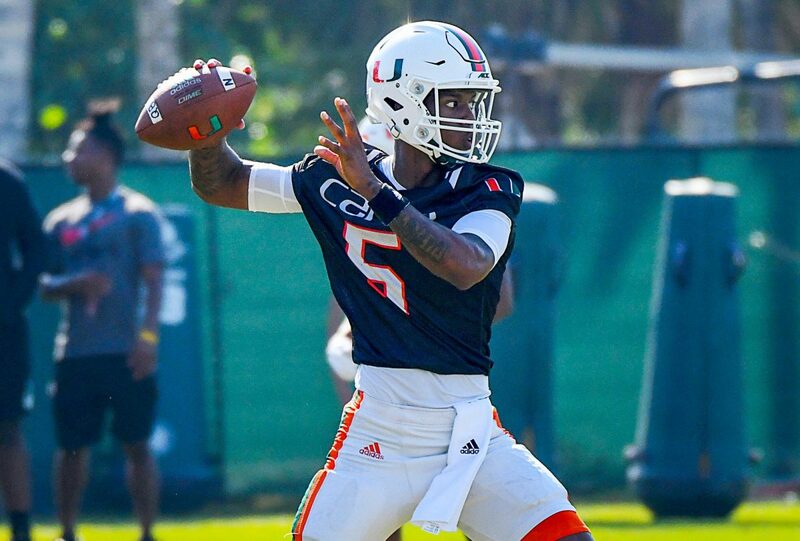 All eyes were on the early-enrollee freshmen and the quarterbacks as the Miami Hurricanes put on their pads and cleats to participate in the annual spring game April 14 at Hard Rock Stadium. For the first time in 2018, the public got a taste of what the U is cooking. The Canes played white versus orange in a glorified, in-house scrimmage for 15,875 fans to enjoy. Quarterbacks Malik Rosier – who started all 13 games for Miami last season – N’Kosi Perry and Jarren Williams, who were not allowed to be tackled, all had their highlight moments in otherwise inconsistent performances, but freshman receiver Brian Hightower stole the show with four catches for 100 yards and two touchdowns. Hightower’s performance led Team Soffer to a 17-0 victory over Team Carol. Both scrimmage teams were named after Carol Soffer, who donated the $14 million lead gift for the Carol Soffer Football Indoor Practice Facility that is expected to be ready for use in the fall. 1. No quarterback stole the show … So it’s still Rosier’s job to lose. After Miami’s first scrimmage just a week prior to the spring game, head coach Mark Richt told media that Rosier is ahead of everybody in the quarterback competition so far, and from the looks of it, that didn’t change at Hard Rock Stadium Saturday, April 14. Rosier went up against the Hurricanes’ toughest defense – the first unit – and with inconsistent protection, he was sacked four times and had to constantly scramble from pressure each snap. Outside of an early 36-yard bomb to redshirt junior Lawrence Cager, he didn’t do anything particularly outstanding, but given the circumstances, he held his own. Rosier finished 9-of-14 passing for 105 yards with no touchdowns or interceptions. Perry showed off both a strong arm and the ability to run with the ball, but his accuracy remained erratic. He threw a pinpoint 30-yard pass to tight end Brian Polendey down the left sideline and made a perfect back-shoulder throw to Hightower on a 9-yard touchdown catch, but he also missed a few routine passes near the sideline and down the middle. The 6-foot-4 redshirt freshman completed 11 of his 25 passes for 166 yards, a touchdown and an interception. He also ran for 45 yards on eight carries to lead the rush attack. Another look at redshirt FRESHMAN N’Kosi Perry using his speed to scramble for 10 yards during @CanesFootball spring game. Williams had his own issues getting the ball out quickly, which is expected from a true freshman, but against the second-string defense, he proved his capability to extend plays with his feet and the arm strength to make all the necessary throws in college football. The 6-foot-2 freshman completed 9 of 14 passes for 107 yards and a touchdown. 2. The defense is miles ahead of the offense. In 2017, it was UM’s defense that kept games competitive when the offense would go through head-scratching lulls of production. During the spring game, it was much of the same, especially from the first unit. The defense racked up nine sacks, 9.5 tackles for loss, one interception and a forced fumble. Led by sophomore Jonathan Garvin, junior Joe Jackson and freshman Greg Rousseau, the defensive line dominated, rushing the passer and giving the quarterbacks very little time to make throws in the pocket. Even though the defensive line deserves credit for its overall performance Saturday afternoon, it clearly exposed an offensive line that is still trying to find its footing. Both Tyree St. Louis and Navaughn Donaldson have switched positions this spring, moving to left and right tackle, respectively. “Our edge players so far this spring have been a little too much for our tackles right now,” Richt said. That will clearly be one of Miami’s focuses going into the summer and fall. 3. The receiving core is going to be dynamic. It doesn’t necessarily show in the stats – a big part of this having to do with the quarterbacks’ lack of time to throw in the pocket – but the Canes’ receivers will wreak havoc on opponents next season. Even without star receiver Ahmmon Richards, who is recovering from surgery to a torn meniscus in his left knee and did not play, the depth at the wideout position is impressive. The Canes return 6-foot-5 Cager, 6-foot-4 Darrell Langham and the explosively quick Jeff Thomas from last season. They also have speedy Mike Harley, who runs some of the better routes on the team. This is all not even including Hightower, who looks to be settling in nicely with the offense, as well as freshmen Mark Pope and Brevin Jordan, who will be in Miami come summer. Langham recorded three catches for 66 yards, including a 41-yard reception that he caught over two defensive backs, and Cager had two receptions for 48 yards. Thomas reeled in three catches for 29 yards, while Harley recorded four catches for 23 yards. The Canes have three spring practices remaining, including the team’s final spring scrimmage set for Saturday, April 21.